I'm a bit late to the party with this one - what kind of self-respecting Star Wars fan waits almost a week to see the latest installment in the franchise? One whose partner was too busy to see it right away I guess... but I did finally see Rogue One this week. The spoiler-free version is that I liked it. I've always loved the Star Wars universe as a whole, with my interest not being limited to Jedi and lightsabers (that's why I play a trooper! ), so seeing a film that tells the story of a bunch of "normal" people in a Star Wars setting was right up my alley. I've also seen people say that Rogue One seems to be made for fans who enjoyed the original trilogy as kids and have been longing for a grittier and more adult Star Wars film targeted at where they are now, and I do agree that the film hits that spot very well. Personally I just felt that it did the whole "grit" thing almost a bit too well, to the point where I actually found it pretty exhausting emotionally, as I'm a huge sap when it comes to my entertainment and there's only so much "bad things happening to good people" I can take. I can also relate to some of the criticisms I've seen: that Jyn's journey isn't very fleshed out and that the relationships between the different characters aren't sufficiently developed. It did work for me, but my pet tank didn't find those parts compelling at all, which led to an interesting discussion on the way home. 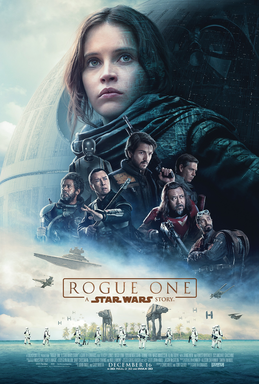 Rogue One poster from the film's Wikipedia page. - That's a lot of hopping between different people and planets. I have no idea what's going on, but I guess it will eventually start to make sense. - OK, I'm starting to get the hang of who is who... except that I can't remember anyone's names. There's Jyn, and her father is called Galen, but as for anyone else? This sadly lasted throughout the entire film, and in the discussion afterwards I had to keep referring to people as "the guy who..." and similar designations. If anything, I would say the film's biggest flaw is giving everyone names that are hard to understand and remember. - Watching a CGI Grand Moff Tarkin, I kept alternating between being amazed by how far the technology has come and being slightly wigged out by the whole thing. However, I'm not sure if the latter wasn't simply the result of me knowing that Peter Cushing is dead and that it therefore can't really be him. Either way the digital artists did an amazing job. - I was less enamoured with Darth Vader's appearances. I thought they tried very hard to stay true to the way he was presented in the original trilogy, but what seemed scary in the seventies doesn't necessarily have the same impact forty years later. To me he came across as awkward rather than menacing. - About halfway through the film, I suddenly thought to myself: Hang on, how close to Episode IV is this supposed to take place? Because this is starting to look very close. But none of these guys even get a mention in A New Hope... oh god, that means they are all going to die, aren't they? With regards to Vader, I like to look upon his most notable scene with a comparative view; this is the first movie where we see a group of nameless mooks slaughtered by a lightsaber while our perspective is on their side of the table. Episode I, II, and III: Nameless mooks are droids, Geonosians, and, eventually, Clones, so no emotional pang for these since the Jedi are made to look heroic anyway despite their "no killing unless necessary" mantra. The only possible exception comes in Episode III where some nameless mooks are killed by the now-villainous Vader on Mustafar alongside the named Separatists, but then we also want them to die anyway since they were themselves villains, so does this really count? Episode VI: The nameless mooks are Jabba's Sail Barge guards and the escape from Tatooine is portrayed as heroic, right down to using one of the most iconic pieces of music the saga produced. Bonus point for one Scout Trooper mook on Endor. Rogue One forces us to see what was previously portrayed in the Star Wars cinematography as nothing short of absolutely heroic from the perspective of heroes who we want to see escape and succeed. Sure, this turning-on-its-head could have had far more impact if one of the main characters was among them (Raddus would have been the 'best' choice of sacrifice with how everything else had played out beforehand), but this interpretation remains pretty solid even so. Maybe it's just me, but even though I didn't think that scene was particularly scary when watching it for the first time, it still stands out as rather harrowing in retrospect. My big problem in the whole movie is: yes, it's an aweome movie as long as you are lobotomised or caught up in the action so much that you don't think about things for just one second. The moment your brain starts, the movie turns into a terrible mess. 1. Why the heck did the guy send the data about "we build a death star, i am the chief engineer, you have to steal the plans there... "
I mean, he was the chief engineer, if he did not have the plans, how did he do his job? But if he had them, why didn't he send them along? 2. The rebels first want to save the pilot, to then suddenly are all over "forget him, just kill him, the information probably is not helpful at all"? How stupid are the rebels, they get promised information on a super weapon, but rather don't want it? 3. The deserting pilot comes with a holo recording of that rebel leaders best friend. But instead of checking out the holo, he rather has uses his octopus-pet on the pilot, who might be a friend and ally? 4. Also the guy cares for the woman for years, then -because plot- abandons her in a cave, for "somebody might have guessed who she could have been"? I am sorry, doesn't work for me. 5. There are several conversations during the movie where the rebels were like "we only pretend that we don't know about the death star". If they actually had no idea, the conversations were very weird. 6. Along similar lines, some of the empires internal infighting and the double-leader mess only makes sense if you know that one of the actor was completely computer animated and they probably wanted to cut a bit costs. It does nothing for the story itself, only bogs it down. As for your point 1, there are several possible explanations for this, but from my point of view the simplest and most obvious one would be that he didn't send schematics along because he wasn't trying to just send them the plans, he was hoping to give them a reason to rescue him (and then work alongside the Alliance on taking down the Death Star together). As for 3 (and 4 to some extent), that seemed to be done intentionally to emphasise what a messed-up and paranoid individual Gerrera (yes, I had to look that up :P) is. His first thought upon seeing Jyn, a young woman he raised like his daughter, is that she must have been sent to assassinate him! Of course a so-called defector claiming to deliver a personal message for him from a friend he hasn't heard of in at least a decade can't be anything but some sort of sophisticated trap that he mustn't touch with a ten-foot pole until he can be certain of its nature. That said, I agree that the first half of the film was a bit muddled and I wouldn't be surprised if there were more inconsistencies in there that I don't remember. Though I do think people are a bit quick to start yelling "inconsistency" these days just because characters in a film don't act perfectly logically (because human beings are so well-known for doing that...) or just because everything isn't spelled out in giant flashing letters. We had 7 movies with the iconic "Star Wars opening crawl". In those movies most of the hero's and heroin's come out alive. Most even have their limbs still attached. You know, I wouldn't have thought ahead of time that I would miss the opening crawl this much, but it certainly seemed awkward to go from "A long time ago in a galaxy far, far away..." to panning across space with nothing in-between. After seeing Stardust's fan-made opening crawl, I also think that actually having one would have helped a lot with setting the stage!